Astronauts demonstrated space tailgating recipes on the ground in a new NASA video. 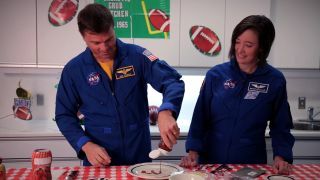 When you're making munchies for Sunday's Super Bowl party, consider the challenge astronauts face in space: In a zero-gravity environment where much of the food is freeze-dried, how can you make good football-watching food? The recipes include "space s'mores" (involving cookies, pudding and brownies), space bruschetta (with shelf-stable tomato and eggplant, as well as garlic and pesto) or space queso (much like the Earth version, but with shelf-stable ingredients). Their greatest invention? Wiseman recalls a time during Expedition 40-41 in 2014 when the crew really wanted hot dogs, but they couldn't make them. Instead, they came up with a modified space burrito, whose ingredients included a beef patty, baked beans, macaroni and cheese, and an ample amount of ketchup (which Wiseman called a "binding agent"). "In space, there are no measurements that matter," Wiseman said in the video, liberally squeezing the ketchup bottle. "Unless you're doing science, where measurements do matter," he quickly added.